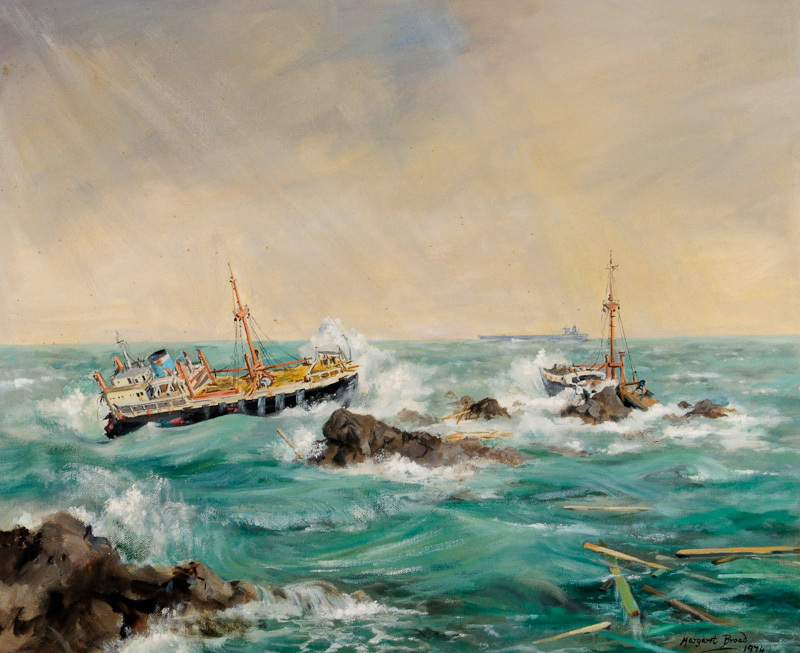 Many ships have come to grief on Guernsey's rugged west coast. Ships have sailed these waters for over 2,000 years and must keep well clear of the reefs which run all along the coast. Until the sea-lanes were moved a safer distance from the shore in the 1970's, you could stand at Fort Grey and watch the Channel shipping on the horizon. A George III cannon has been recovered from the frigate HMS Boreas and now stands at Fort Grey. It points towards the Hanois reef where the ship foundered in 1807 with the loss of 127 men. Over a hundred ships are known wrecked in the Hanois area between 1734 and 1978. Many must have gone unrecorded before that, the earliest known being in 1309. On Christmas Eve 1973 the giant ore-carrier Elwood Mead lay stranded for six weeks before salvage crews managed to refloat her. Its crew survived, unlike those aboard the freighter Prosperity wrecked only a month later and lost with all hands. Relics of many ships which have come to grief on this coast are displayed within the Fort Grey Shipwreck museum. One of the strangest was the oil rig Orion salvaged in 1978 after being grounded at Grandes Rocques. 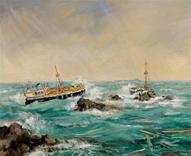 Amid the tragedy and loss is the almost humorous story of the SS Briseis, wrecked off Vazon in 1937. Its cargo of Algerian wine casks floated ashore, leading to scenes of drunkenness and disorder. The last ship driven aground within sight of Fort Grey was the giant unfinished hull Vermontborg. In January 2003, the big red ship became a bizarre local attraction until salvaged later that year. Relics of the west coast shipwrecks are on display at Fort Grey. Relics from other famous Channel Islands shipwrecks including the Roman Ship, HMS Charybdis and SS Stella are on display at the Maritime Museum, Castle Cornet.